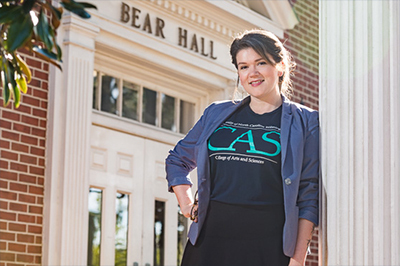 As a UNCW staff member, Daniella Murray '15M said she feels motivated to support the university’s academic mission through financial contributions. “I give back to the places where I’ve worked because I have gained and grown so much from those experiences,” she said. Submit items for the next SWOOP by noon on Friday. The last SWOOP of the semester will be distributed May 8. 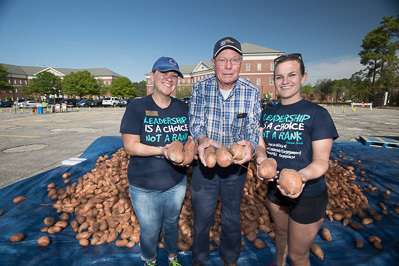 Jaime Russell (left), director of UNCW's Office of Student Leadership and Engagement, stands with North Carolina farmer Royce Stone and Katie Hug of CENC Food Bank at the "Yam Jam" held on April 18. More than 16,000 pounds of sweet potatoes were sorted to share with area food pantries.